I would like to widen the frequency range of a simple parametric EQ, but I am not quite sure which components to replace. This parametric EQ gives a frequency sweep from 250Hz to 6KHz and I would like to extend the lower range to 100Hz. Could this be as simple as replacing only capacitor C13 to a higher value ? Does C14 or R20 /R21 need to be adjusted too ? I was going to experiment by trying different values on C13, but I thought it wouldn't hurt asking for some guidance first. Interesting. I think it´s c14 instead. And I got it totally wrong haha. Sorry. C13 in parallel with R21 and the pot while C14 is in series is what tells it. 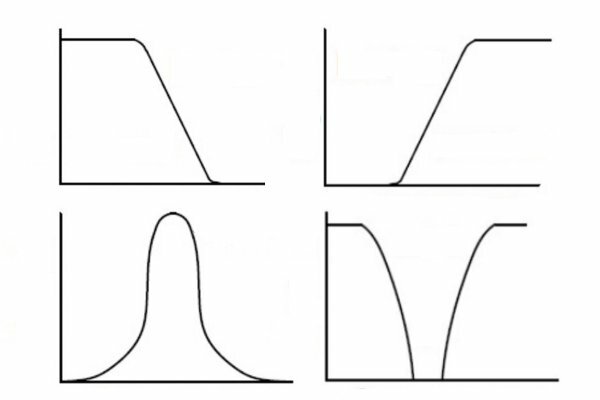 Need to study the other filter types, not just lp and hp. Hi Mooger5 and thank you for the help, I deeply appreciate it. Is C13 affecting the lower or upper range? Or am I oversimplifying things ? As you can see, in order to get different ranges , only the 2 capacitors are changed to a different value. The values are multiplied by 10 and so is the resulted range. 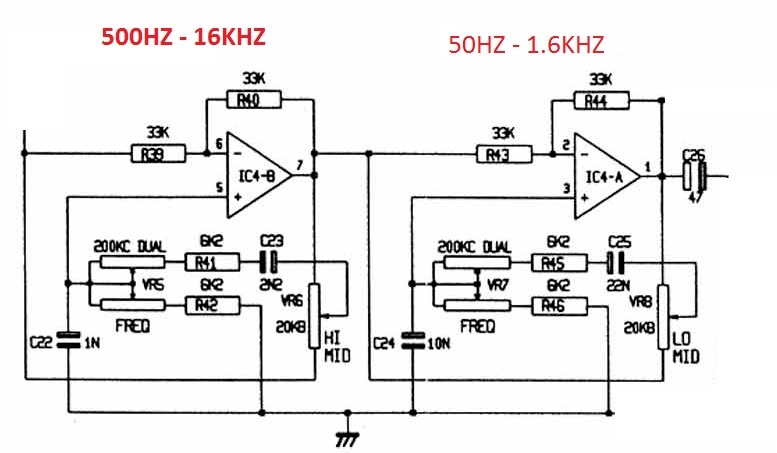 Back in my original schematic, lets say that I want to widen the range from 250Hz-6KHz to 25Hz-60KHz ( for the sake of simplicity), what replacement values would you recommend for c13 and c14? Hi no prob this keeps me thinking. Look to extend the bass range you must increase c14 so the hp fc goes lower. Oops its the other way around. Sorry im at work. Later. In the actual problem, to extend the low range from 250hz to 100hz the capacitance c14 must be increased to 44n. 47n is the readily available value. It makes more sense now, many thanks and sorry for distracting you from your work. Whenever your can, could you please explain how did you come up with the 44n value ? According to 2nd schematics that i have posted , I thought that If use a 47n for C14 the lower range will drop from 250Hz to 25Hz. Because I could see the graphics and based my calcs on them. Its 4n7 on the circuit because its a "standard" value. 100hz 22n/2=11n, not 44n. Sorry keep forgetting capacitance inversely proportional to frequency. 10n or 15nare common values. I´m OK with this mess because we´re having a conversation, not releasing a finished technical paper for public scrutiny. Now why is C14 the cap responsible for widening the low end of the pass band? 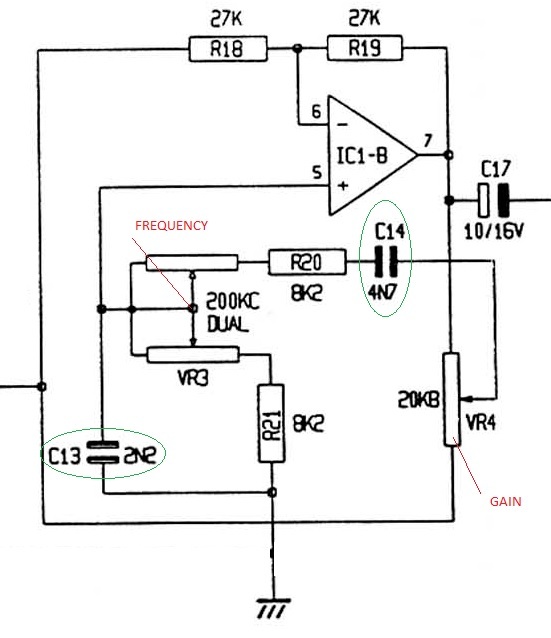 A band pass filter is a low pass with a high pass, cascaded. In what order doesn´t matter. C14 is the HPF, C13 is the LPF. VR4 is what determines the type of filter. With wiper in the middle, nothing gets through C14, because it´s a mix of the original signal with the same signal inverted by IC1 at unity gain. The levels being equal, both cancel each other out. So the mid position is, I believe, zero. Moving the wiper towards IC1, C13 sees the inverted signal at full level while the original signal is fully attenuated. C14 acts as an HPF, C14 as an LPF, the filtered signal returns to IC1 via the non inverting input and in phase with the opamp output. The result is true band pass filter. Moving the wiper away from IC1, C14 sees the original, non inverted signal at full level, while the inverted signal is fully attenuated. C13 and C14 still act as LPF and HPF respectively, but now the filtered signal entering the non inverting input is out of phase with the opamp output, because it´s derived from the original signal and maintains its coherence. Mixed with the inverted signal at full level, what was an HPF becomes an LPF and vice versa. The result is a band reject filter. I have to admit that yesterday I read your last post over 20 times, I was trying hard to understand what happens to the signal, but I was feeling too damn because I could not get it right. This is my weekend project, I will let you know about how it goes. Thank you for your help and for both practical and scientific explanations, you made me feel wiser today ! Yeah I can see the error now. Its difficult to reply and not being able to look at the image at the same time. It can be frustrating to look at some complex schematic for the first time. You just think What the h**l I will never be able to fix that! But preserverance or better yet obssession pays well. The more you think about it the will become clear. Leave no stone unturned. Learn with your mistakes and keep going on. Exaust all possibilities. Dont let it go. And it that doesnt work, trash the damn thing abuy a replacement hahah. Im glad to help others not to feel intimidated by technology. I learn as well.